You can apply easily by filling out the registration form and adding the documents mentioned. You can easily upload these documents on our registration platform. For your registration it is absolutely necessary that you are enrolled at a University in your country. We can’t offer participation to professionals. That’s why we ask you for a certificate of enrollment. This is a certificate saying, that you are a member of your University. Concerning the Upload of a Health insurance certificate (or in Europe a blue EHIC card): Just upload a file saying “I will organize my health insurance as soon as I have been accepted for Kempten International Summer School”. That will be fine. You are welcome to apply for Kempten International Summer School, if you are a Bachelor or a Master student. Please note that registration closes on April 30, 2019. If you want to benefit from the early bird discount, don’t miss February 28, 2019. For professionals there is a Professional School of Business & Technology at our University. You are welcome to look at what they offer. https://www.hs-kempten.de/weiterbildung/professional-school-of-business-technology.html The text is also available in English. Not included in the price are travel expenses, health insurance, accommodation and food, as well as all other personal expenses. You will receive a hands-on introduction, meaning that there will be a lot of practical work during class hours. Our participants especially appreciate the support of our tutors, who are around most of the time and can be asked if you have questions concerning the class or a particular exercise. Classes will be interactive and will give you the opportunity to work on your own project. how a leading company in Germany works with Data Science. We will provide everyone with a desktop computer to work on. You have about six and a half hours of class everyday, which adds up to about 45 course hours in total. Classes start everyday at 9 am. At 12.15 pm you will have a lunch break for 1 hour and 15 minutes. 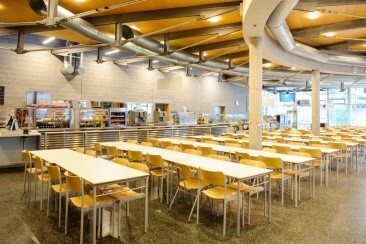 You have enough time to either eat in the canteen of the University (called „Mensa“) or get something to eat in the nearby shopping center or a supermarket. In the afternoon classes run from 1.30 pm to 4.45 pm. During classes you will have a 15 minute break after 90 minutes. On the last day, Tuesday, 30th July, class ends at 3 pm. On your first day, Monday, after class there will be a city rallye to explore Kempten from about 4.45 pm to 6 pm, and on Tuesday, there will be a „Bavarian Get together“ from 5-8pm. On the weekend there are activities planned from 9am to 6pm, you will be exploring Munich on Saturday and take a trip to the famous „Neuschwanstein“ castle on Sunday. The schedule is only a draft and may be subject to changes. Participants need to make their own travel arrangements. We recommend you to arrive by Sunday, July 21st. 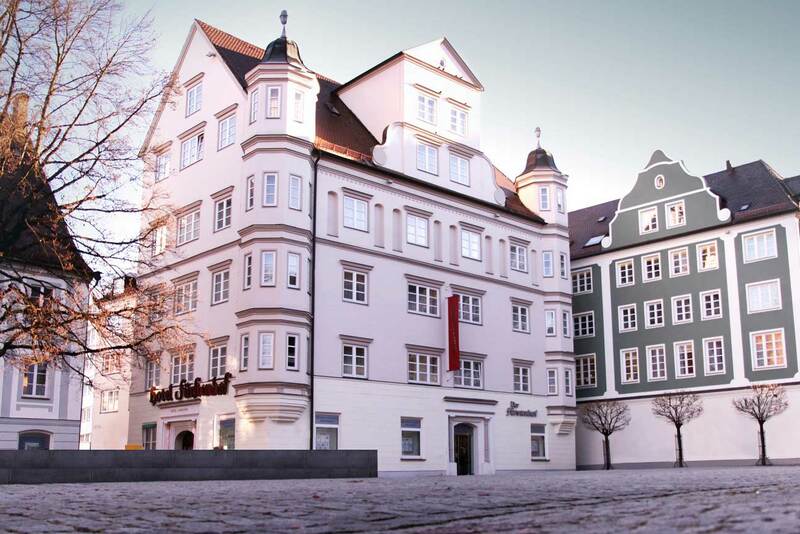 However, as Kempten is quite busy in the summer season, we have reserved a number of rooms for our participants. 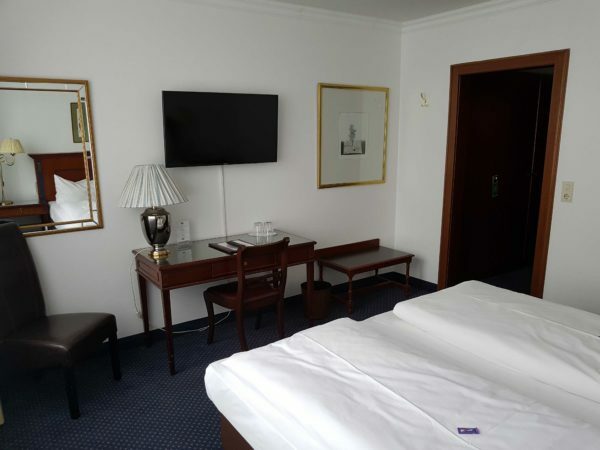 You are welcome to stay in the Fürstenhof, one of Kempten‘s most well known hotels directly situated in the historic town center next to the beautiful town hall. All shopping facilities and restaurants are nearby and Kempten University can be reached only within a short walking distance. Hotel accommodation can be booked for € 39,50/night per person in a double room, delicious German breakfast included. A single room can be booked for € 59,00/night, with breakfast included. Hotel Fürstenhof is only a 20-minute walk from Kempten University. You cross the pedestrian zone, continue to Forum Allgäu and then along Station Road (Bahnhofstraße) to Kempten University. We have reserved rooms from Sunday 21 July to Tuesday 30 July 2019. Check in is possible from 3.00pm on / Check out untill 11.00am. Reception is open 24 hours. If you wish to book a room, please contact the hotel directly mentioning that you take part in the summer school (for the special rate). If you wish to arrive earlier or stay longer, please arrange this also directly with the hotel. If you have got further questions concerning your accomodation, feel free to ask us. Please note that it’s your own responsibility to apply for visa. Kempten University of Applied Sciences doesn’t offer any assistance other than a letter of acceptance and, if necessary a letter of invitation. This letter will help you to apply for visa. Please make sure you are provided with adequate health insurance during your stay in Germany. The proof of health insurance is basically necessary. How do I get to Kempten? Kempten is situated in the south of Germany, between Munich and the Lake Constance, next to the Alps. Kempten can be easily reached by air (Airports Memmingen (FMM), Munich (MUC), Stuttgart (STR) and Friedrichshafen (FDH)), by train (www.bahn.com) and by bus (e.g. Flixbus). 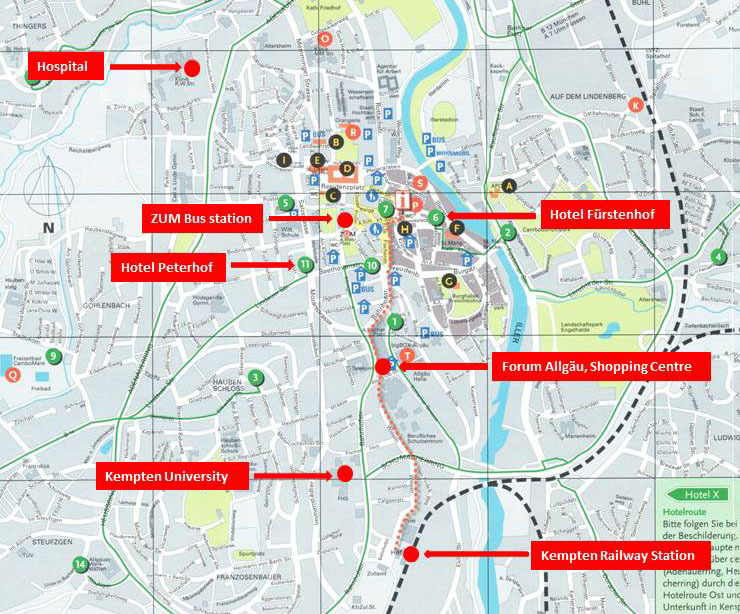 Our beautiful campus and modern University are within walking distance of the historic city centre (8 min) as well as the rail and bus station (2 min). If you need assistance concerning an Airport Shuttle from Memmingen, feel free to ask us. There are buses provided from Memmingen Airport to the Memmingen Rail Station (4,5 km away in town). By train, Kempten is only 30 minutes away from Memmingen. Upon arrival at Kempten Railway Station you might want to take a taxi to your accomodation. There are also buses, but on Sundays not really many. Buses and taxis depart directly in front of Kempten Railway Station. ZUM is the main bus terminal in the city centre. If you stay in Hotel Fürstenhof, take one of the buses to ZUM. From there it is 400 metres by foot through the pedestrian zone. Bus No 6 connects ZUM with “Rathaus” (town hall), but unfortunately not very often. Without luggage everything in the city is within walking distance. So upon arrival a taxi might be the best choice. Tickets for the bus are available directly in the bus. Please ask the driver. They also offer day and week passes. A day ticket for Zone Zero (Zone NULL in German) is 3,50 € and within Zone Zero you can go wherever you want how often you want. All accomodations except HOSTEL ALEX are within Zone Zero. Hostel ALEX is in Zone 1. You can also get day and week passes for Zone 1, but the ticket is only valid for a specified route then. E.g. from Hostel Alex to Kempten Railway station. Kempten University is one stop before Kempten Railway station. On the way you always pass by ZUM (City Centre), so that includes the most important places. A week pass is 13,60 €. Please note that buses, smaller bars and smaller shops often only accept cash and no credit cards. Within Kempten everything can be easily reached by foot. From Hotel Fürstenhof (Townhall) to Kempten University it is just a short 20 minute walk. 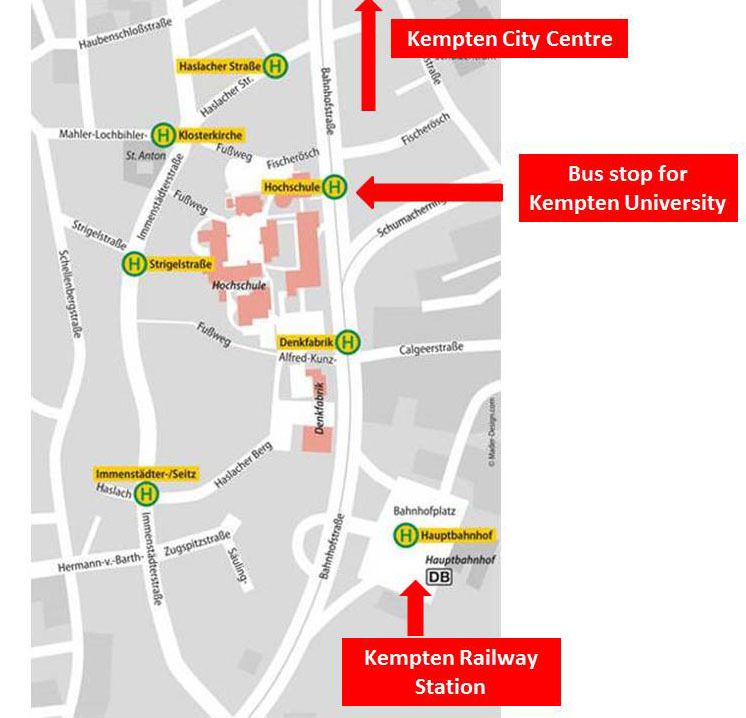 You can also reach Kempten University with several bus lines. The city bus lines 3, 6, 8 and 9 stop directly in Bahnhofstraße (Station Street) at the stop „Hochschule“ (University). Tickets for the bus are available directly in the bus. Please ask the driver. They also offer day and week passes. A single ticket is 1,80 €, a day ticket 3,50 € and ticket for a week (MON – SUN) is 13,60 €. A day ticket for Zone Zero (Zone NULL in German) is 3,50 € and within Zone Zero you can go wherever you want how often you want. All accomodations except HOSTEL ALEX are within Zone Zero. Hostel ALEX is in Zone 1. You can also get day and week passes for Zone 1, but the ticket is only valid for a specified route then. E.g. from Hostel Alex to Kempten Railway station. Kempten University is one stop before Kempten Railway station. On the way you always pass by ZUM (City Centre), so that includes the most important places. Please note that buses, smaller bars and smaller shops often only accept cash and no credit cards. Please check www.mona-allgaeu.de for all information concerning bus connections. There is a quite helpful app you can download from GOOGLE PLAY. 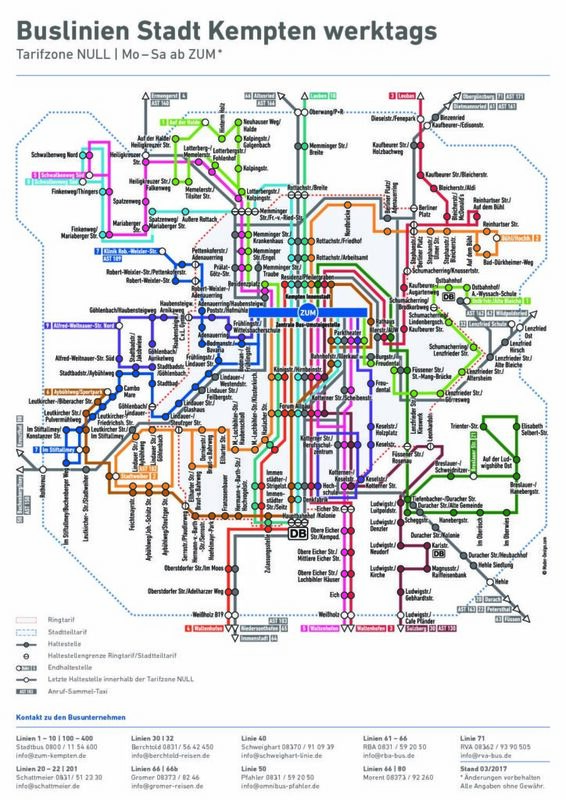 It is called “BAYERN FAHRPLAN” and contains all timetables for buses and trains. 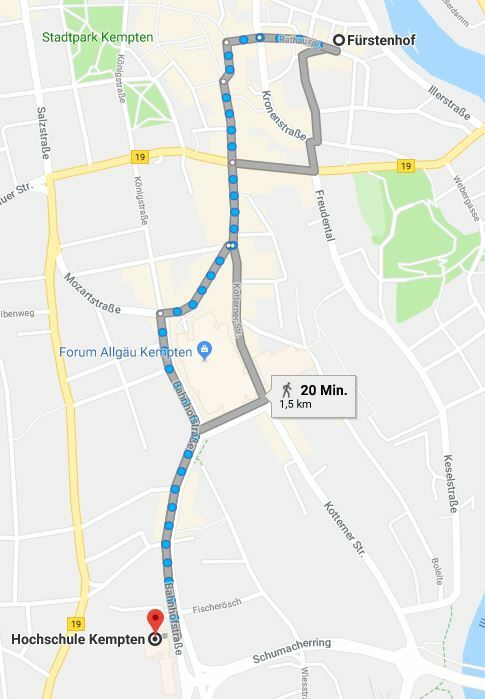 Again, to get to University you can go with the city bus lines 3, 6, 8 and 9, that stop directly in Bahnhofstraße (Station Street) at the stop „Hochschule“ (University). 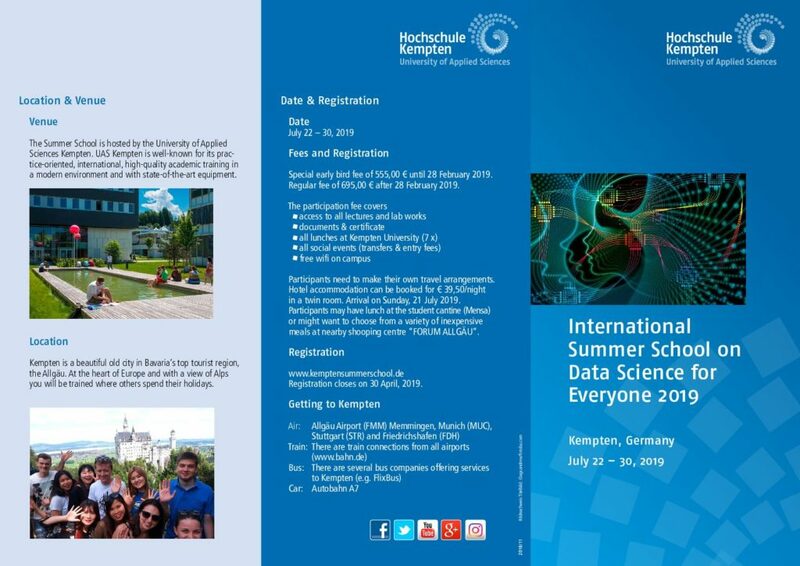 Please keep in mind our regulations for Kempten Summer School when registering. Here in short, our payment and cancellation policy. The course fee has to be transferred within 14 days, once a participant has received his confirmation, by bank transfer . Please note that we can’t accept any payment by credit card. If the course fee is not paid on time, the participation will not be secured any longer. 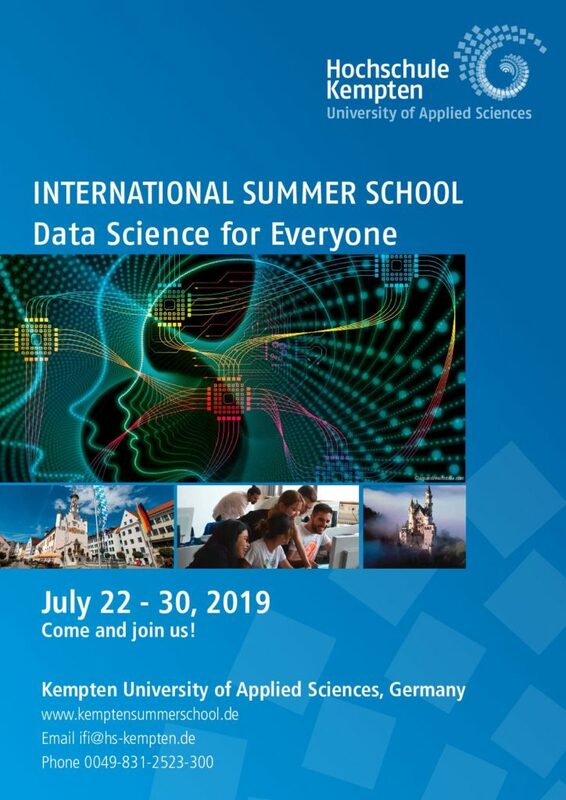 The Summer School organizers will inform all participants as soon as possible, at the latest one week after registration closes, if the miminum number of participants has been reached and Kempten International Summer School will savely take place or if it has to be cancelled due to lack of interest. Participants should keep this in mind, when making travel arrangements because any expenses will not be reimbursed. It is only possible to cancel the course due to personal, unforeseeable reasons, for which the participant is not responsible, for example, if someone gets sick or if a family member dies. The participant will have to prove his reasons by presenting a medical certificate or a death certificate. In this case the course fee less an administration fee of €40.00 will be reimbursed. Germany has about 82 million inhabitants and its capital is Berlin. Germany is in the Central European Time Zone (CET). The main language spoken is German, but English is understood and spoken by most people, especially younger people. In general Germany is a safe country. There are four seasons in Germany – usually it is spring from March to May, summer from June to August, autumn from September to November and winter from November to February. In spring it is warm outside, and the first sunshine comes out. In summer it can get hot, up to 30° C degrees and in autumn it is kind of chilly but very beautiful with colorful leaves falling from trees. In winter it is cold outside, it can snow, and temperature can fall under 0° C. Always be prepared for any kind of weather in Germany, since it can change very quickly. The currency used in Germany is the Euro. Generally, it is best to always have some cash on you since little shops or public transportation might not accept credit cards as a payment. Credit cards are usually widely accepted and ATMs to withdraw money are very common. The supply in Germany runs at 230V and sockets generally require a two-pin plug with rounded prongs. If needed, you should bring an adapter. Supermarkets are open from 7 am to 8 pm. Shops usually open from 9 or 10 am to 6 pm. All shops and supermarkets are closed on Sundays, but little bakeries are open to get breakfast. Restaurants have varying opening hours but are usually open on Sundays, too. Kempten University started in 1978 with only 82 students. Until today, the University has grown to accomodate over 6.000 students in 32 different degree programs. Particular important aspects for the University are a practice-oriented education as well as an international orientation. The University has about 80 partner universities abroad. The main faculties are Business Administration, Electrical Engeneering, Computer Science, Mechancial Engeneering, Social and Health Studies and Tourism Management. 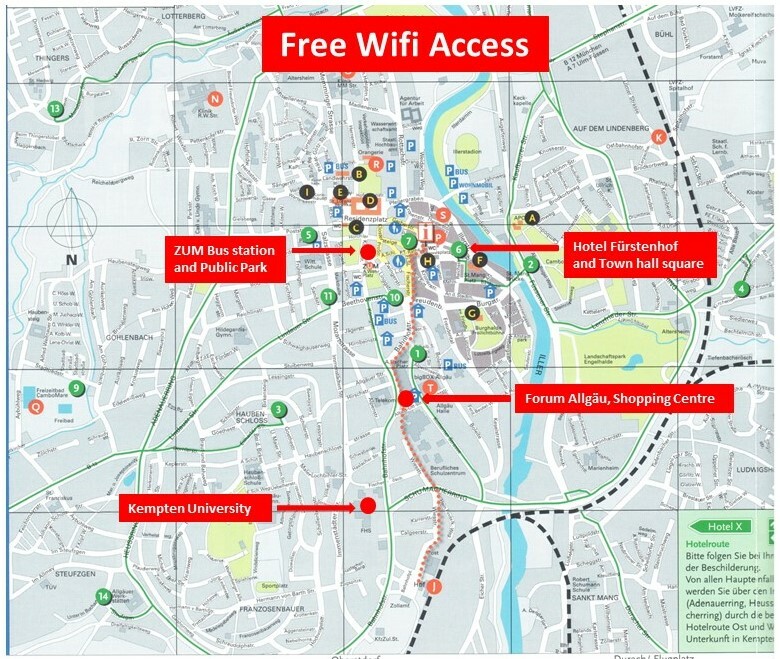 At Kempten University there is free wifi provided by Bayern WLAN. at the „Stadtpark” (Public garden), next to the ZUM – the central bus station in Kempten. At shopping center „Forum Allgaeu“ free wifi can be accessed for two hours per day. Hotel Fürstenhof also offers free wifi to all of its guests. Kempten is the oldest city in Germany, founded in 4 A.D. by the Romans. It was called „Cambodunum“. You can still visit some of the ruins in the archaeological park Cambodunum. Today about 70.000 people live in Kempten. It is situated just in front of the Alps and surrounded by a beautiful landscape typical for the Allgaeu region: impressive mountains, beautiful lakes and interesting cultural sites. In the South of Germany it is one of the most popular holiday regions. Kempten is close to Castle Neuschwanstein (only 30 minutes by car!) and the Wieskirche, a beautiful Baroc church, and situated in the 3 countries triangle, Germany, Austria and Switzerland at Lake Constance (Bodensee). People also love the short train connection to Munich (1,5 h). We study where others spend their holidays! In Kempten you can visit Basilika St. Lorenz, a beautiful church right next to Kempten Residency, the former home of a prince abbot with unique golden interior. You can continue to Town Hall Square (Rathausplatz) with its fountain as well as some nice cafés. Kempten offers several highly interesting museums like the Alpin Museum, with information about of the Alps, or the Allgäuer Burgenmuseum, a museum about the castles of the Allgaeu region. In your free time, you are welcome to explore Kempten’s pedestrian zone with lots of stores, as well as Forum Allgaeu, the biggest shopping center in the region. You can also wander around the city to see some of its lovely historic buildings or take a walk down to the river Iller and enjoy the sun with an ice cream. During the day, in your lunch break, you can eat at the University. 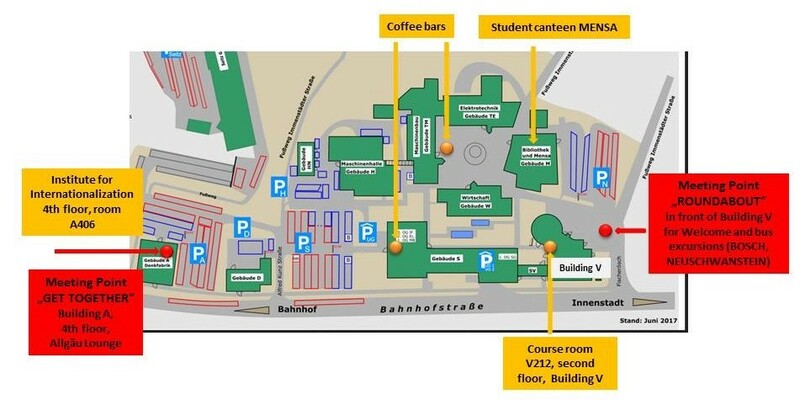 There is a student canteen, called Mensa, and coffee bars. Pizza, a McDonalds and many others. You could also go to a supermarket. There is one across the street from the Universty, called Netto. You can get all kinds of groceries there and they also have a little bakery that offers sandwiches. Another supermarket is Rewe, it is about a 5 minutes walk from University towards the city center. They also offer a wide range of groceries, but they do not have a bakery. There is a supermarket called Norma, next to the hotel Fürstenhof, where you can go before or after class to buy some food. Supermarkets are very common in Germany and their opening hours are usually from 7am-8pm from Monday to Saturday. On Sundays supermarkets and all other shops are closed. For dinner you could try one of the many restaurants in Kempten. A very popular one, where you can also watch sports, is Times, an American diner. Asian food and sushi is offered at Sushi & Nem and you can get great pizza at L’Osteria. For other restaurant recommendations, feel free to ask our German students!